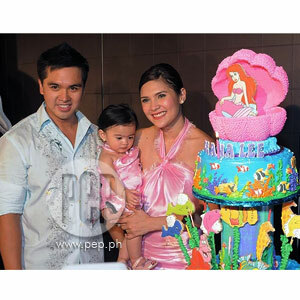 The star-studded celebration for Ceana's birthday took place at the Manila Ocean Park last April 24, where her parents, businessman Cedric Lee and Agua Bendita actress Vina Morales, gave her a Little Mermaid-inspired party. Vina Morales was flush with happiness as she went around the Lo-ok function room of Manila Ocean Park to greet the guests of her daughter Ceana's first birthday celebration. "It took me about a month to prepare," Vina told PEP (Philippine Entertainment Portal) at the party which was held yesterday, April 24. She pointed out that Ceana's actual natal day falls on the 25th but they opted to celebrate it a day earlier. The first-time mom was hands-on with the preparations even though she was busy taping for the primetime series Agua Bendita, which has set locations in Morong, Bataan. "It was actually the idea of Ceana's father [Cedric Lee] to have this theme [inspired by Disney's Little Mermaid]. Before pa lang, when I was pregnant with Ceana, we went here and we checked the venue. Akala nga namin yung binyag dito gagawin, pero first birthday pala." Vina revealed that it was Cedric who shouldered the expenses for the party. As soon as guests entered the venue, they were greeted by a photo booth where they could have their photos taken for free. There was a tarpaulin showing the logo of the event, "Ceana@1," and featured the Disney mermaid character Ariel and her sidekick, Sebastian the crab. Toys to be given away were prominently displayed near the stage and labeled as Ceana's underwater treasures. A popcorn booth and a chocolate fountain were also set up at the venue for the benefit of kids and kids at heart. Most of the children were dressed in various costumes such as mermaids, fairies and other characters. One of the highlights of the event was the appearance of four "mermaids" who appeared in the giant tank in the function room and performed a mesmerizing production number. At the end of their show, they held up a waterproof tarpaulin saying "Happy Birthday, Ceana!" SOURCE OF HAPPINESS AND CONTENTMENT. It was a controversial time for the Vina when she became pregnant with Ceana, but she stressed that all those troubles were nothing compared to the happiness that her daughter has brought her. "Alam mo, every time that I'm with her, lahat ng intriga at problema na dumaan sa buhay ko, hindi ko na nga iniisip yun. Sa ngayon, thankful ako that I have her in my life. Wala akong regrets. Talagang kuntentong-kuntento ako sa buhay ko ngayon, wala na 'kong mahihiling pa," she said with a smile. "Ang sarap din ng feeling na nandito ang mga taong nagmamahal sa 'yo. At hindi lang sa akin, kay Cedric rin kasi ang dami naming mga kaibigan. We're very happy that most of them came. "Ang sarap pala ng feeling na magkita kayo ng kapwa mommy at makikita mo naka-costume pa yung anak nila." Vina's younger sister, Shaina Magdayao, blocked off her schedule so she could attend the birthday party of her niece. Among the guests who attended were Ruffa Gutierrez, Chesca Garcia, Dimples Romana and Gladys Reyes—all of whom came with their children. Chesca was accompanied by her husband, basketball player Doug Kramer. Vina's co-stars in Agua Bendita—Matteo Guidicelli and child star Xyril Manabat—were also present. Other stars who graced the occasion were German Moreno, Ana Roces and Pops Fernandez. ON CEDRIC LEE. There have been reports that Vina and Cedric Lee have been fighting recently. The ASAP XV performer did not deny this. She said, "Kami naman away-bati. I'd rather not talk about it. Basta this is a very happy day for us and kami naman, there are times na may tampo kami pero normal lang yun sa may relasyon." PEP asked Vina about the qualities of Ceana that may be similar to her and to Cedric. "Sa daddy niya, pa-cute siya," she said with a laugh. "Sa akin, nakuha niya ang pagiging makulit. If she wants something, yung eyes niya naka-focus lang dun. She's a very active and very happy baby. Palaging naka-smile lang. She also loves music!" When asked if Vina wants to have another baby soon, she said that she would rather focus on her career first. She is open to the possibility of endorsing products with Ceana but she would have to discuss it with Cedric if they will allow their daughter to enter showbiz in the future.